I have used the MiBand on and off for about 10 months, and got one mainly because it was not expensive. Though the unit itself is good, it's band doesn’t last long due to wear and tear. You can read my review here. I recently received a GOQii band in the mail and was super-excited! All the more because recently I have increased my efforts towards being fit – joined Zumba, avoid eating outside on weekdays, started having infused water. 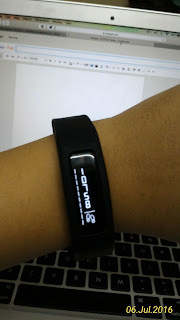 So this upgrade to the GOQii fitness band seemed to compliment the entire situation! I have now tried the band for more than 3 weeks and writing the review on public demand. This was one of the biggest plus points for me, when I talk of upgrading from the Mi Band. The LED screen show's time, date and day, battery level, steps taken, hours of exercise, calories burnt, kilometers walked and karma points earned. You can even customize to show notifications or have the band vibrate when it calls or as an alarm. The call and alarm feature was there in the Mi Band too, but seeing icons for the notification to distinguish between email or text etc is a bonus in the GOQii band. I have turned notifications off because it went berserk with alerts as I get too many emails or messages. When you purchase the GOQii band, you get it along with a 3, 6 or 9 month fitness coach. You can choose from a short-listed set of coaches and then they ask you questions about your lifestyle, food and exercise habits, discuss your goals and help you meet them. When I say help, not only do they suggest lifestyle and diet changes based on how easy or difficult you want it to be, but also motivate and inspire you on a regular basis via the inbuilt chat by giving you tips, asking you if you exercised today or giving anecdotes and more. My Fitness Coach's name is Ishita Garg, and she is always pushing me to meet my daily goals, and though I'm struggling with them even though they're easy, she will keep trying without being too strict or anything. If you went to a nutritionist in your vicinity, you'd probably pay a similar amount that you pay here for the Band AND coach for 3 months (You can continue using the app and activity tracker without the coach after your subscription is over, in-case you do not want to renew). 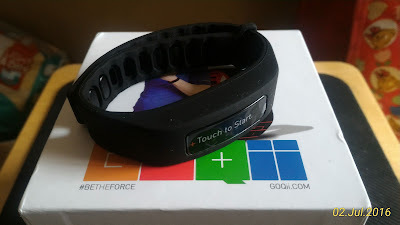 The GOQii is currently available at a discounted price of Rs.2399 with a 3 month coach, which is paisa vasool as compared to other high end fitness bands like the Fit Bit. The unit and band quality is also decent plus it's pretty accurate and not unlike some other fitness bands who count steps even when you're driving or commuting in the train. Imagine not only ticking off all your fitness goals, but contributing towards social welfare through it; sounds unbelievable right? 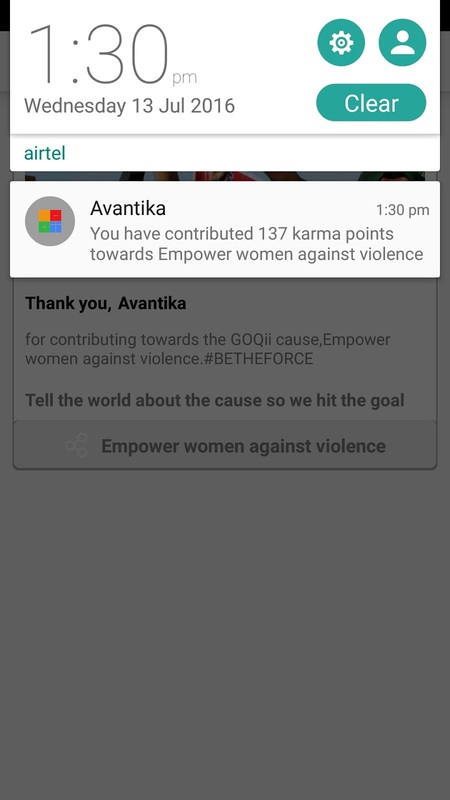 The GOQii breaks all norms by it's Karma points, which you can collect with your steps taken, and then contribute towards a cause listed on GOQii. 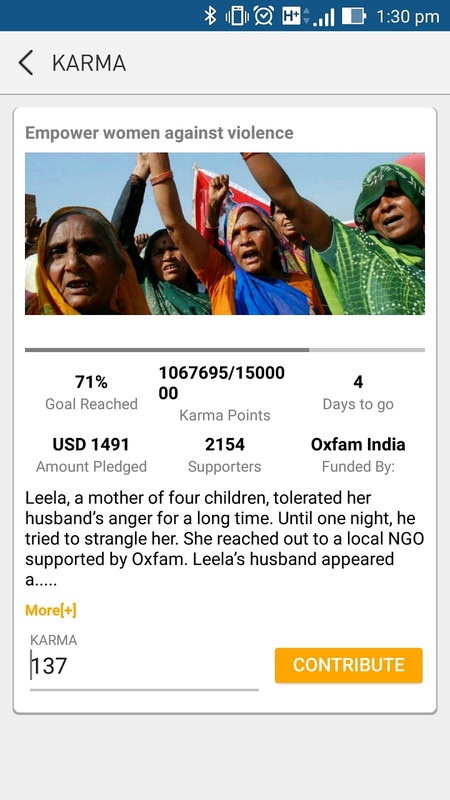 No more excuses for not helping out the needy, and the more your steps the more your Karma points! Brilliant move, GOQii! Just like the MI Band, the GOQii also comes with a unique charger that connects with USB to charge via your PC or wall USB charger. I really dislike this feature of fitness bands because if you misplace or lose the charger, then you're stuck, or if you're travelling and the battery drains you'd have to carry the charging cable too. Life would be much simpler if it charged via Micro USB. The GOQii is water resistant and can withstand splashes of water, sweat, rain and a shower. But the user manual clearly states that it's recommended to remove the band while bathing or swimming. I didn't want to take a chance so I remove the band before I go for a bath, which I did not have to do with the Mi Band (though maybe that's the reason the band deteriorated easily). In the last 3 weeks, a couple of times I forgot to wear the band again after getting ready because I was in a hurry. Also, if you're a swimmer, this is bad news. 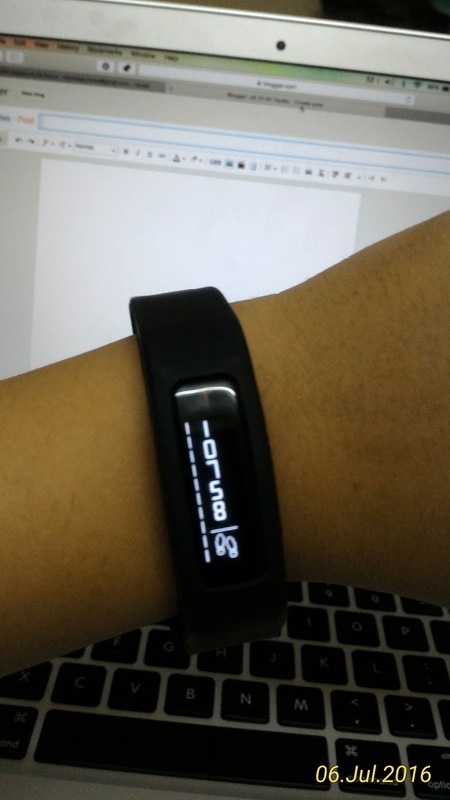 Unlike the MI Band which detected sleep (though not quite accurately), the GOQii has to be switched to sleep mode and back to active mode by long pressing the device and following the steps. I usually don't switch it to sleep mode because it completely skipped my mind to put it back on the active mode till late in the day on a couple of instances. The GOQii band requires to be charged every 8-10 days on an average. The Mi band would have to be charged only once in a month and it was good to go. Though it's understood that the GOQii displays much more and requires more power, it would have been kinda great if I had to charge it less frequently, like my Kindle. In the last 3 weeks - I have got quite a few useful tips from my coach for me to loose weight and stay fit. My spirits have been lifted every time the device gives me thumbs up when I meet my daily goal. of-course this is in combination with the Zumba classes I joined in June and am loving, so it's a overall great feeling to feel fitter. My squats are lower, though it's not visible to others but I can already feel a little thinner and am certain if I follow all the things my coach has suggested, by the end of the three months i.e. October I will be able to fit into my pre-pregnancy clothes! Have a wedding to attend in November too so all the more motivated. Of-course they're new and developing basis all the feedback they receive, Im sure there'll be so much more to see in the future. I totally forgot to mention that they keep having fitness challenges and offline activities too, where you can meet other GOQii members and exchange notes on fitness! 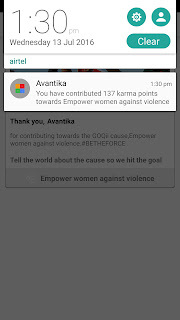 You can purchase it from http://goqii.com/in-en, use my code AVANT248 and get a further 10% off! I know that the Mi Band 2 also has a LED display, but it still lacks the personal coach and Karma points, which are a game-changer in the fitness band business!